My niece is visiting. And what’s a trip to the Big Island without a tour of the live volcano? 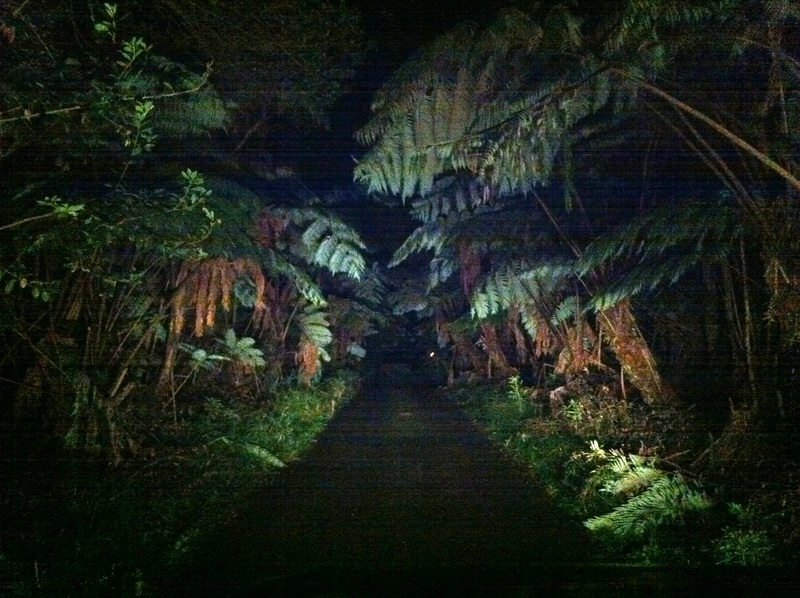 So I drove my daughters and niece to Volcanoes National Park on New Year’s Eve. 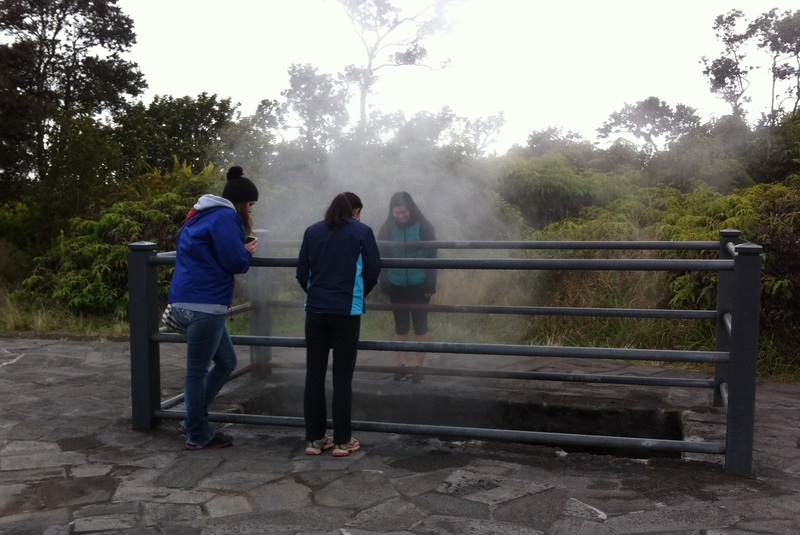 Upon arrival, I used my new knowledge of Hawaiian culture protocol and we cleansed ourselves at the steam vent and made our offerings to Pele at the edge of the Kilauea Caldera. Then we drove over to the Jaggar Museum, the site of the Hawaiian Volcano Observatory, and the closest spot to view the Halema’uma’u Crater, Pele’s home. Unfortunately, the weather did not cooperate. 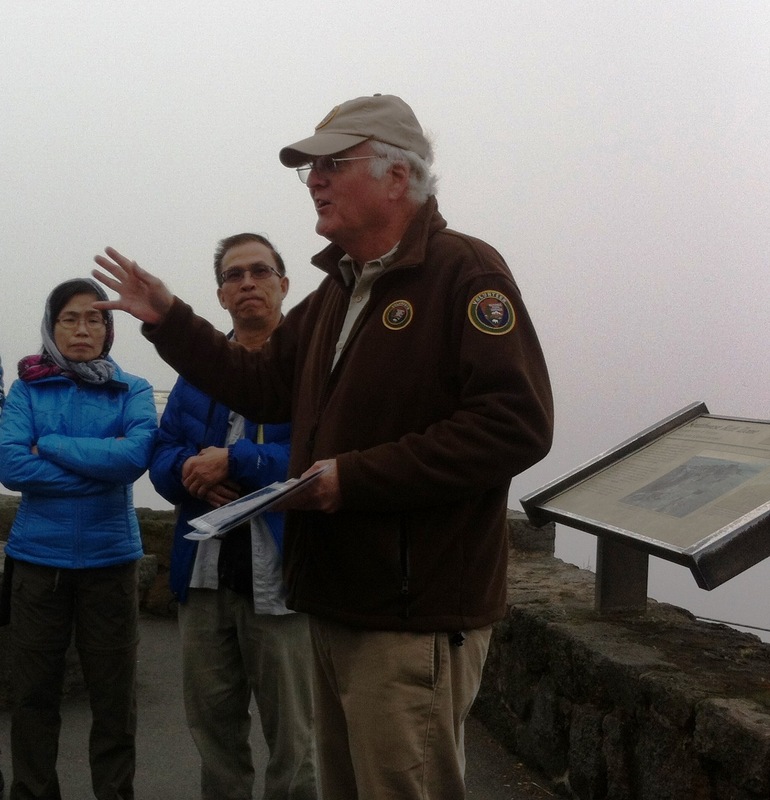 A thick fog settled around us at the lookout while we listened to a park volunteer give a talk, and soon we couldn’t see the crater at all. 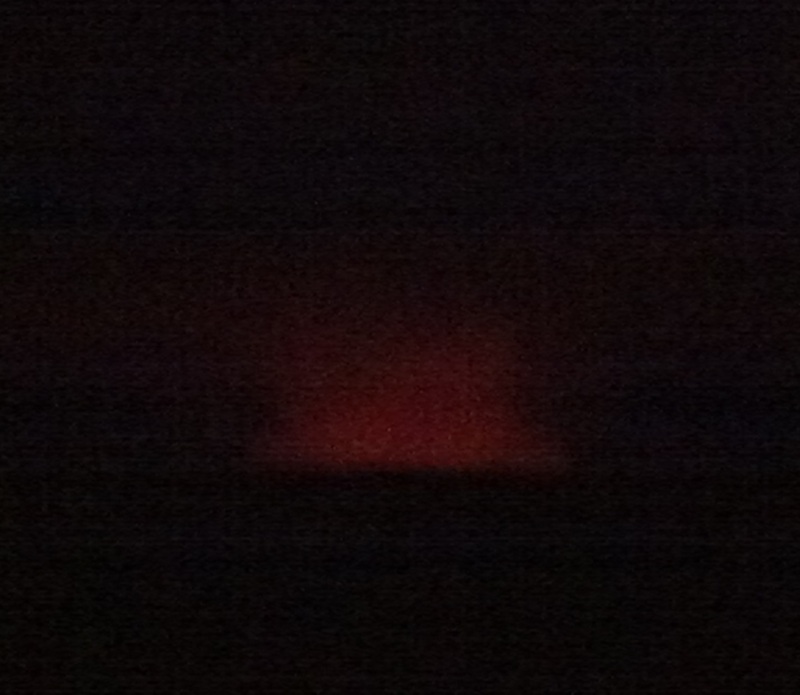 He told us that if we stayed until dark and the weather cleared, we would see the glow from the crater. It wouldn’t be dark for another hour, so we regrouped at Volcano House, the hotel that’s been on site since 1846, hosting Mark Twain in 1866. 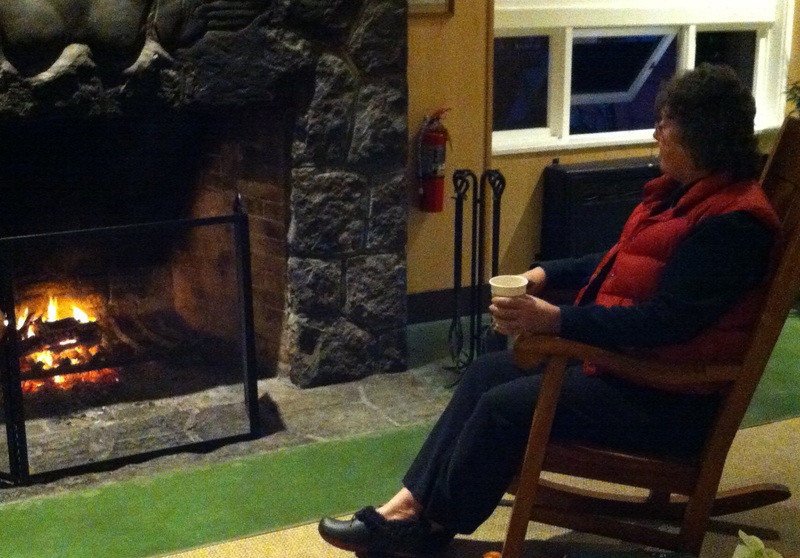 Resting on wooden rocking chairs, we savored hot cocoa in front of the fireplace. At 6:30 pm we reluctantly abandoned the mesmerizing fire and followed a long column of cars back to the lookout. What a zoo! Everyone had the same idea – see the glow as early as possible, then head out to other New Year’s Eve activities. Rangers directed us to park along the road because the Jaggar Museum lot was full. We walked to the lookout in a stream of bodies, guided by tiny lights and the well-lit windows of the nearby latrines. Getting closer to the viewing wall, we found people jostling for a glimpse and taking obligatory pictures of the fog-obscured glow. Adults huddled in small groups and kids whined that they were cold. One boy lost a whistle over the low wall, and his parents used heavy duty flashlights to search the ground, disrupting the viewing pleasure of others. Soon my girls drifted back to the car, and, disappointed in the experience, I joined them. We spent the night at a B&B in the village of Volcano. Ensconced in our room, we made a light supper in our tiny kitchenette and watched an old chick flick. Snug under warm quilts by 10:30, we were asleep soon after. I woke at 4:20 am to discover the fog gone and the stars shining brightly, so I quietly dressed and snuck out to the car. The village of Volcano is mostly hidden by the rain forest in which it’s embedded. You really can’t see the homes nestled in the woods that grow thickly to the edge of the narrow streets. It creates a spooky driving experience in the pitch dark with only car headlights illuminating the view. While a nearly full moon shone brightly in Honoka‘a at this hour, its light was blocked by the massive mountain of Mauna Loa between us. As I drove into the Jaggar Museum parking lot, I was relieved to see only two other cars. There would be no distractions this time. Feeling my way along, I settled on the low viewing wall, a good 80 feet from my neighbors. The Hawaiian word for lava and volcano is Pele. But she is also considered to be the flow/eruption of the gas from the crater. She was billowing prodigiously, changing shapes, and sweeping to the northwest on a slight breeze. The immense curtain of drifting gas, lit a bright orange from beneath, was a stark contrast to the black sky and bright stars. I didn’t recognize any constellations except for the Little Dipper. Was that the Southern Cross in the south-east sky? Yes, I believe so. My eyes continued to adjust to the darkness over the next 20 minutes. I could see tiny pricks of light on the distant edge of the crater, probably some sort of reflection. They reminded me of the faint lights of a city along the far shore of an immense black lake at night. The vast silence pushed against my eardrums – a strange sensation of total quiet. Then the sound of a low rumble pierced my consciousness. It modulated like the sound of waves on a beach. Gases escaping the lava lake? Lava lapping at the edge of the crater? Total speculation, but the sound was real and continued for as long as I paid attention to it. The whole experience was awesome. I sometimes throw that word around loosely, but this time, it fit. I imagined the ancient people who arrived on these shores to find fire and lava exploding from a crater. They would surely have created a Power, a Goddess, to explain this, if they didn’t already have one. A fearsome Goddess who both destroyed what existed and gave birth to new land. Pele. I felt her presence this night of new beginnings. As my neighbors left, we exchanged New Year’s greetings. Then it was just me and Pele in the first hours of the new year. Fully present, I meditated on the low rumbling, the changing orange gas shapes, the stars and the immense dark sky. Finally, when every breath steamed my glasses, I knew it was time to go: 5:44 am. Soon it would be dawn and the new day would be upon us. And while I was grateful to have this second change to see the glow from the crater, I was chilled to the bone. Back at the B&B, I relished the warmth of the bed and drifted back to sleep thinking about the present I gave myself – the present of being present. Maybe I should take that on as my theme, my focus, for 2015. 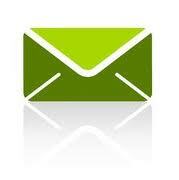 It’s a great personal transformation tool. If you visit the Big Island and Kilauea, I urge you to see the volcano crater by night, or even better, before dawn and before any crowds arrive. A little effort will result in a lasting memory – an awesome memory. May you have an abundant and happy 2015. 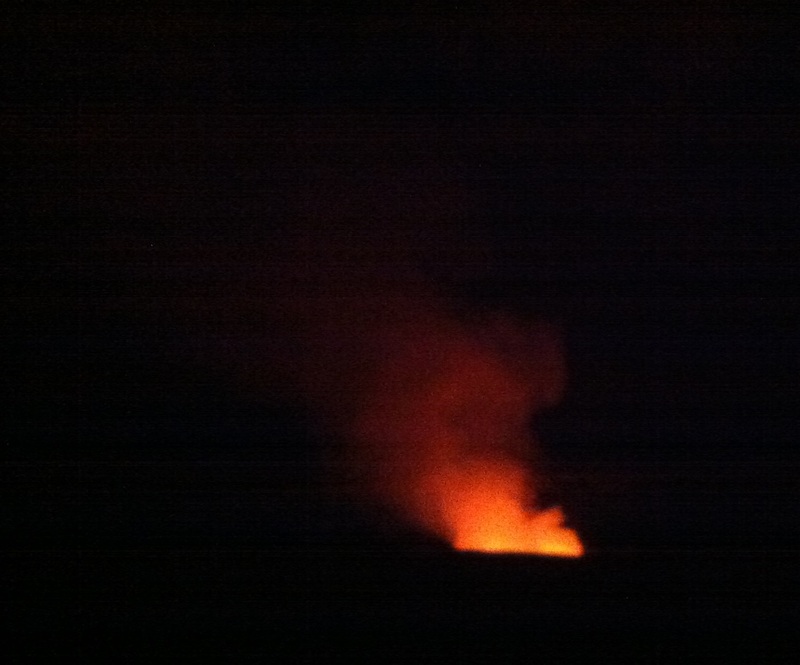 For more on visiting Pele in the dark, see Lava Lake Rising. This entry was posted in Being present, daughters, gratitude, Pele, rain forest, Things to do on the Big Island, volcano, Volcano - town outside Volcano Nat'l Park and tagged being present, Pele, view Kilauea volcano at night, Volcanoes National Park. Bookmark the permalink. I feel the awe. A good reminder to get out of that warm snug bed and see what Mother Nature is up to. Thanks Diane. Yes, this would be a fabulous thing to do. Very spiritual. Gave me goosebumps. Magical. Thanks Diane.